Dry humor with a blank expressionless face. This type of humor is common among shy and socially indifferent people. Includes other elements of humor ranging from shy humor, sarcastic even macabre humor and other personal characteristics which makes it unique to the individual. Deadpan humor is one of the most complex and to many enigmatic comedy styles as only a select few truly understand it enough to appreciate it for it’s brilliance. A blank, expressionless face, especially a performer, who has or assumes a blank expression, impassively matter-of-fact, as in style, behavior, or expression. The similarities between Mike Birbiglia, Demetri Martin, the late Mitch Hedberg, Bill Murray and the TV show The Office resides in the ability to tell jokes without having a change in facial expression or emotions. 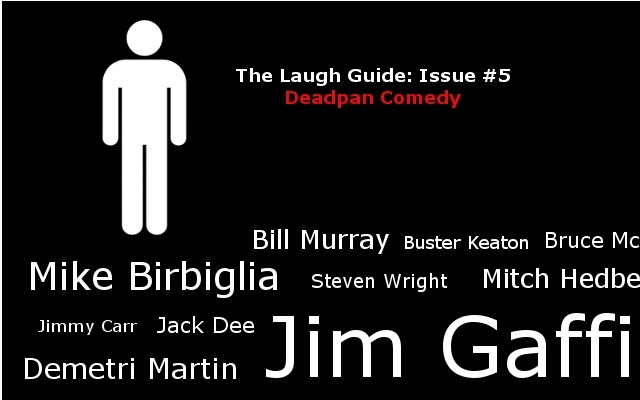 Deadpan comedy is not strictly a style of humor but more a tactic that can be used in short intervals or stretched across a comedians entire career. This strategy of joke telling doesn’t appeal to everybody yet if given the right comedic set up and relatable situation, Deadpan Comedy can make any adult cry with laughter. This approach to comedy took me a while to get accustomed too yet when listening to Jim Gaffigan’s older album, Doing My Time, I became hooked on the monotone, steady, expected pacing of comedic delivery. If you do not like Deadpan Comedy or never heard of this term before, do yourself a favor and slowly integrate some of these comedians in your listening lineup. It’s all about finding a story or topic that you relate with and once you do, like I did with Gaffigan and his story about hot pockets, your standard of living will improve just that much more.